The Faerie Tiend – or Tithe – is a medieval notion. Once upon a time in folklore, Fairies were terrifying quasi-deific creatures. Even the Seelie Court – the “Good Guys” – were notable for riding their steeds through houses, enchanting passers by, and riding to the wild hunt. The Unseelie “Bad Guys” kidnapped children, drove men mad, and inflicted terrible fates on those who disturbed them. The Faerie became the “Fair Folk” because talking about just how unfair, unreasonable, and downright vicious they could be might offend them. The fey were nature spirits – but nature is often pretty unobliging when it isn’t outright dangerous. While Christianity was working it’s way into a position as a fundamental explanation of everything in the world in Europe, a lot of older beliefs were given (thoroughly unofficial) quasi-Christian explanations by their believers – and so wound up as folklore. 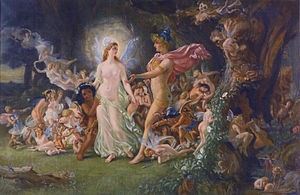 Christian theology had no real place for the fey (or anyone else) as independent powers – so they wound up being “explained” as angels who hadn’t taken a side in Satan’s rebellion or as wandering souls of the dead who weren’t good enough to achieve heaven or evil enough to be automatically drawn to hell (a fate sometimes seen as a way to let such souls continue to act in the world until they qualified for one or the other). More rarely they were considered a hidden race of men with special magical powers to weave illusions to remain hidden – or even as the descendants of children that Eve had hidden from Yahweh, and who had been cursed by God to remain as soulless creatures trapped between heaven and earth. (That last one was a particularly bad fit with Christian beliefs however, and so isn’t that prominent). The fact that you could never catch them, or even see them more than briefly, and so on, was simple enough to explain; they had to have powers of trickery and illusion or at least to were protected by such powers! OK, it might also be that they didn’t actually exist, but we are talking about beliefs here. Of course, since magical powers of trickery and illusion were not of God, they had to be related to Satan – and to Satan’s ability to grant magical powers and dominion over the physical world. The notion of the Tiend was pretty simple; Satan was demanding a more-or-less token price (depending on how you valued souls) from the fey in exchange for granting them their powers, protecting them with his own powers, or just for leaving them alone. After all, if their powers really were independent of his but similar, they were potential rivals. That tithe might be extracted by blackmail, or (in darker sources) it might be an offering of fealty or payment for Satan’s protective services. In any case, Satan was already a master of the physical world, commanded vast magical powers, and had limitless wealth – which meant that only souls or services were truly of value to him. Ergo, the Tiend consisted of a periodic offering of faerie (possibly of faerie children) or – preferably (at least from the faerie point of view, and perhaps from Satans) – humans. There aren’t really enough sources on the idea to be sure whether or not the individuals offered in the Tiend ever returned, or whether they were killed, or were held as hostages by Satan for a time (perhaps to keep the Fey from acting against him), or whether it was simply a “you owe me a labor tax” arrangement. A fair number of sources give “seven years” as the interval, a few imply that each offering consists of seven persons (although more say only one and most do not specify), and a very few say both. Why seven? Well, seven is often seen as a magical number. In many cultures it was the length of an apprenticeship, the time a child might be fostered out, the term for holding a political hostage, the length of a magical cycle, or long enough to declare a person legally dead. It was the length of time of a sojourn in Faerie in the 13’th century ballad of Thomas the Rhymer. That does bring up the question of what those abductees were doing in Faerie… being adopted? “Dying” to the mortal world to become faerie? Being apprentices? Oh well. That’s an entirely different topic. In any case, the Tiend is currently popular in fantasy literature involving fairies since it provides a nicely dark, edgy, threat to hang over the characters. It appears in a lot of versions because it’s folklore (and not especially popular folklore) to start with, and – as folklore is prone to be – was neither consistent from version to version or explained in detail where it did appear. The earliest formal source (and there aren’t very many) may be the Ballad of Tam Lin (Below, in the oldest extant version I’m aware of). The original ballad, however, goes back to at least 1549, since it’s mentioned in “The Complaynt of Scotland” from that year. (There’s a version with some translations and notes over HERE). Come riding oer the fernie brae. Hung fifty silver bells and nine. ‘All hail, thou mighty Queen of Heaven! And I’m come here for to visit thee. But heard the roaring of the sea. Light on the fruit of this countrie. And I will show you fairlies three. That lies across yon lillie leven? Which winds about the fernie brae? Whe[re] you and I this night maun gae. Kevin, in this Federation-Apocalypse session log, was simply taking advantage of the fact that – in the Manifold – even minor stories have some power. On the other hand, all the demons who were capable of making it to faerie and were powerful enough not to get tossed out on their ears immediately had much better things to do than to fiddle around with the Fey trying to collect a few temporary servants. Kevin, on the other hand, visited the place a lot – and he could technically claim to be a demon, and thus entitled to collect the Tiend. Ergo, he used the old story to “rescue” a few of the oldest changelings. Thanks for posting. There are some interesting twists on the motivations of faeries here that I hadn’t heard previously. I fear I’ve been very busy – but you’re welcome.